I can’t believe it, I finally have a finished Farmer’s Wife quilt top!!! As I was piecing the center of the quilt top together, I couldn’t help but notice how pretty it looked on my sewing table. And take a look at those fussy cut sashing squares. It’s one of my favorite things about this quilt now. 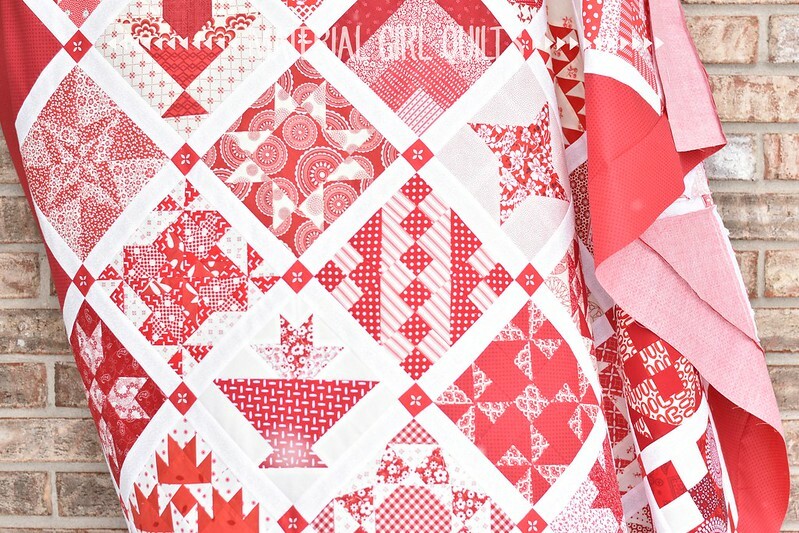 I have counted and there are 101 different red and white fabrics in this quilt top. Today is a snow day for my son, so I decided to take the quilt top out for a few photos. Thankfully I was able to get at least one full shot of the front of the quilt (notice the little snow flakes flying). As I stated in my last post, I am using only 50 of the Farmer’s Wife quilt blocks in my quilt. I used the same layout that they call for in the book (same size sashing, etc), it’s just smaller than the bed sized versions. My quilt finishes at about 57″ x 66″. That one full shot above was all I could get because the wind had other plans as you can tell by the photo below. Right after i took this one, the quilt fell from one of it’s hangers. Even though the quilt top was now only “half” hanging, it still made for some pretty shots. This last photo shows the border fabric a little clearer. It kind of reads as a solid, but is actually a red on red dot. Thanks to you all for the encouragement along the way. This quilt is a lot of work, but worth it in the end (no matter how many blocks you make!). Beautiful! I like the fussy cut sashing corners too!! Your quilt top is so beautiful! Congratulations an a wonderful work of art! Your quilt is just stunning! A tremendous amount of work! Great job! Congratulations! Beautiful quilt! 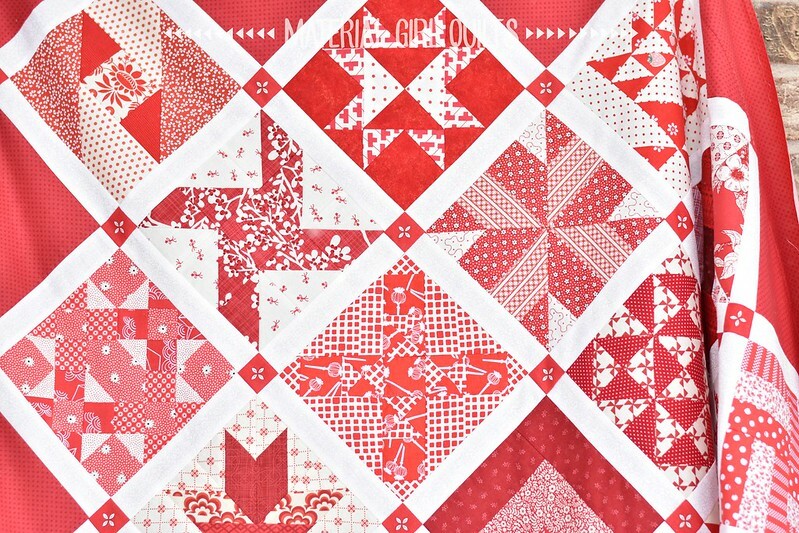 I love the red and white and the fussy cut sashing squares. Was this made from red and white scraps? It’s fabulous! I love that you did red and white! I love it! So pretty in the reds. 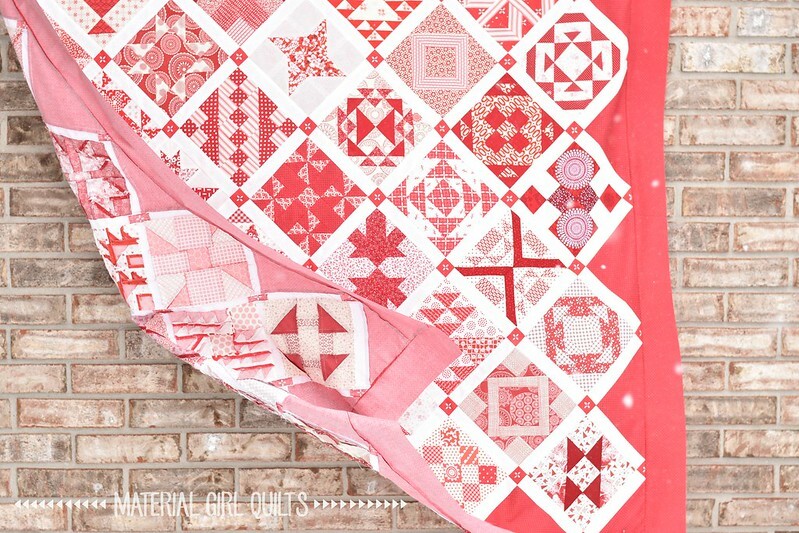 A stunning red and white quilt!! Congratulations! Sometimes, we just have to let the experts take over. I love the top and can’t wait to see it quilted. Fussy cutting is always worth it. holy cats ! it’s simply stunning! Wow!!!! 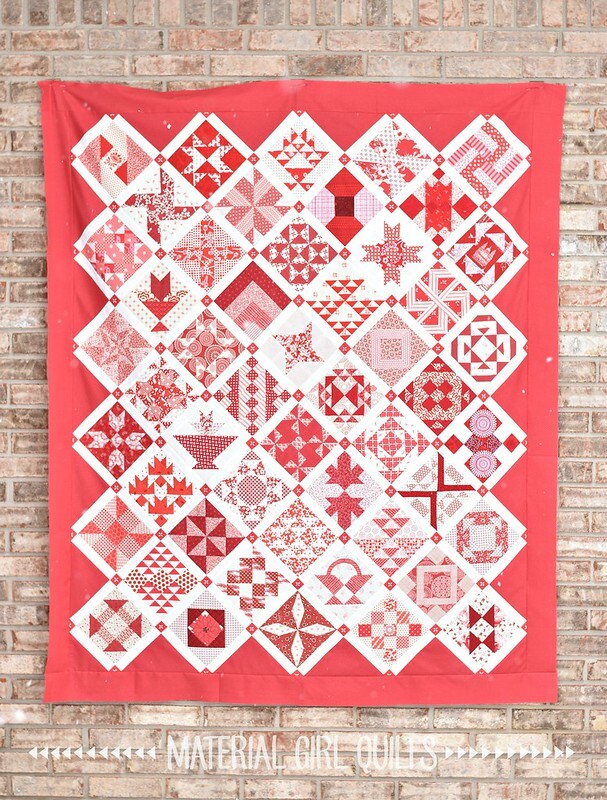 What a beautiful quilt, I love the idea of using just red and white, it gives it cohesion and makes it incredibly fun to look at because you’re always spotting something new! Congrats! on getting your quilt top completed. Can’t WAIT to see it quilted!! Fantastic work – it is super pretty! Just wanted to tell you how much I love your quilt. 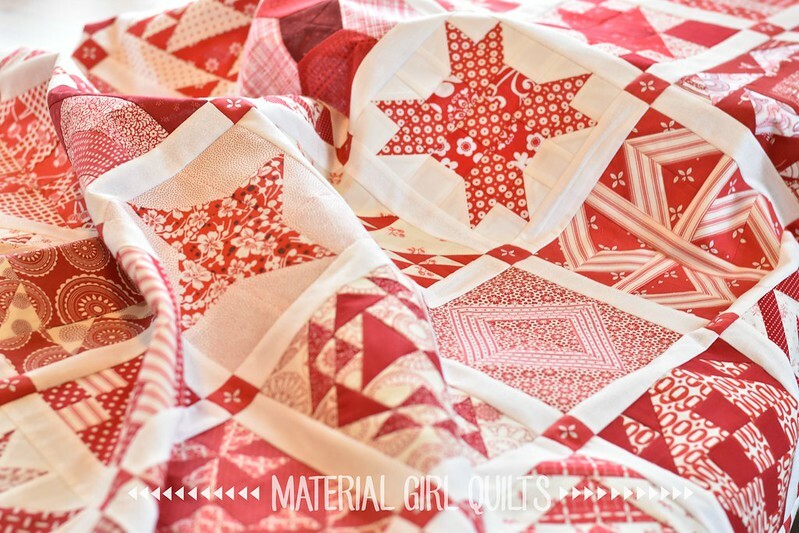 It wants me to make a red and white quilt too! Yours is really lovely! This is hands down the prettiest Farmer’s Wife quilt I have seen. 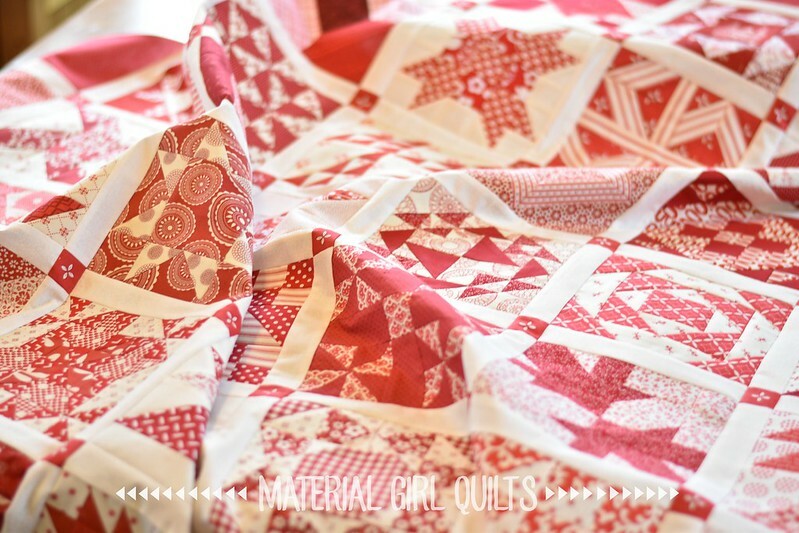 I started a red and white themed one back when the quilt along started. You’ve inspired me to want to pick it up again. This is stunning. Is this Farmers Wife 1930’s? I used the original Farmer’s Wife quilt book – not the 1930’s version.